What Programs Are Available In The Virtual Format? This is the original barbell class – a weights class for absolutely everyone. The 30 or 55 minute class gives you a total body workout and will make you toned, lean and fit. A high energy martial arts-inspired non-contact workout. In the 30 or 55-minute class you’ll learn how to punch, kick and strike your way to superior fitness and strength. A 30 or 55-minute new yoga class for anyone and everyone. Combining yoga, Tai Chi and Pilates-based movements set to music, it will improve your mind, your body and your life. In this 30-minute workout you’ll learn how to activate the muscles that create optimal core control, the vital ingredient for a stronger body, while chiseling your waist line. An insanely addictive dance workout. SH’BAM™ is an ego-free zone, where a fun-loving instructor guides you through simple (yet sassy) dance moves, all set to a party playlist. What Goes In To Les Mills Virtual? Every year Les Mills invests over $200m creating and distributing group exercise classes, consistently raising the bar using a process we’ve developed over the last 30 years. The teams behind each of our programs listen to thousands of songs every quarter to narrow it down to just the 10 or 15 that are used in the release. 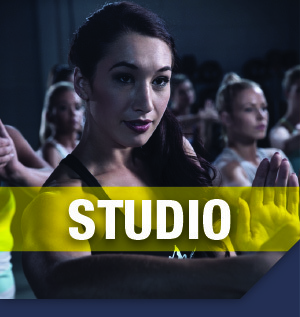 While we’re creating the music, we’re also choreographing the classes, combining scientific insights with carefully developed formulas designed to optimise results and ensure that the classes are safe. The teams and creative directors trial new choreography for weeks. Then it’s time for live class trials (often in classes of up to 200 people) and a chance to get the public’s reaction. A new class will be trialed and filmed up to 20 times before it goes to our Group Fitness Director and technical team to polish and sign it off. Once a new class has been signed off, it gets sent out to our video presenters. These are the best instructors who are hand-picked from the instructor events that we hold around the globe each quarter. Presenters travel to New Zealand for a week of intense training from a variety of movement, vocal and theatre coaches. We film with a live audience, which gives our video content a great atmosphere. We use the same film crew that’s used for international sporting events and music videos. We film with multiple cameras rolling through the whole class, so capturing every aspect of the complete Les Mills experience is guaranteed. And at the end of all this, we deliver the world’s best classes. Now available to you, anytime. Les Mills Virtual is technology based group exercise played via a projector screen in clubs. It's designed to provide consumers with a group exercise fix at any time of the day as well as help get even more people engaged in group exercise, becoming fitter and getting hooked on the Les Mills experience. Why is Les Mills now offering these virtual classes? We know that technology within the fitness industry is moving along at pace, and in response to the increasingly busy lives of club members and the need for flexibility, we believe that virtual classes will soon become a regular feature on club timetables. As leaders in group fitness, Les Mills is well positioned to provide a world class virtual product that perfectly complements the live group experience. By providing Les Mills Virtual clubs will soon be able to extend their group fitness schedule into time periods that have traditionally stayed out of reach for group exercise – and as a result, get more to experience the benefits of Les Mills' world leading group exercise. Is Les Mills Virtual replacing the live classes? Definitely not - we are 100% committed to our live classes that are loved by the millions of people who take them around the world every day. Every year we invest millions into developing world class content for our live classes and supporting our 100,000 strong instructor tribe to deliver the very best live group fitness experiences possible. We have no plans to change this. Because we believe that nothing can replace the real thing. We are committed to live instructors as the ultimate expression of our classes. We know that a recording can’t reach the heights of a live instructor, who can build personal connections and provide one-on-one coaching. Les Mills Virtual provides clubs with a way of running group exercise outside of peak times when instructors aren’t available. This will help get more people into group fitness and along to the live classes – and that’s when they get hooked! Are all Les Mills™ programs available as virtual workouts? 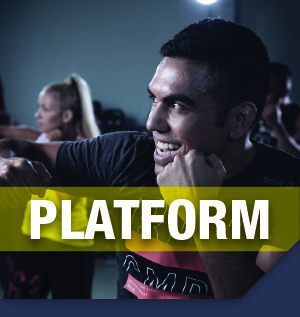 BODYBALANCE, BODYCOMBAT, BODYPUMP, CXWORX, SH’BAM and RPM are currently available in the Les Mills Virtual format. The program releases are updated every three months with new choreography and music to ensure they are fresh, and in line with the latest research. There is also a back catalogue of releases available but the latest release will not be made available in Virtual format only live. I already have live classes. Do I need Les Mills Virtual classes too? Les Mills Virtual makes it easy to extend your group fitness offering. With Les Mills Virtual you can simply add classes that shoulder your live classes in the morning and evenings, add more classes throughout the day or provide classes at unusual times like the middle of the night. If you’d like more details around how you can best leverage Les Mills Virtual classes, please get in touch. What about the safety of participants in a Les Mills Virtual class? You can be confident that participants receive proper instruction on safety and technique as each Les Mills Virtual class is based on Masterclass content, and features some additional safety guidelines at the start of the workout. Clubs offering Les Mills Virtual are also provided with a suite of materials that will encourage Les Mills Virtual participants to perfect their technique by mastering the program specific moves. Who’s responsible for overseeing safety? We’ve been really careful to ensure that Les Mills Virtual classes contain excellent instruction on safety and technique. Clubs delivering Les Mills Virtual are responsible for doing so in a safe environment and are encouraged and supported to provide safety and supervision just as they would to any other gym goers working out on their own terms – ie on the club floor. What about live class numbers? We know that an amazing live Les Mills class is an unbeatable experience. Developing Les Mills Virtual is a strategic move designed to strengthen our brand as a leader in group fitness – so we can reach more group fitness newbies, hook them in on the Les Mills experience and ideally inspire them to try a live class. Feedback from our trials has indicated that Les Mills Virtual classes can be a great place to gain confidence and learn the moves before stepping into live classes. Does this mean we can now share this content more widely? Les Mills instructor content can not be played in clubs, the release content that we distribute to instructors is for instructors only. 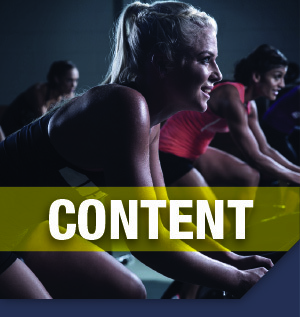 Clubs that choose to license Les Mills Virtual are provided with content and music that is specifically designed for the virtual experience and have new or extended legal contracts that enable them to play this content via their virtual hardware. Can facilities just offer Les Mills Virtual workouts on their own or do you need to offer live Les Mills classes too? With Les Mills Virtual, clubs must have Les Mills live class/s license for to be able to license in Les Mills Virtual. This does not have to be the same live class as Virtual. Les Mills Virtual content is delivered through a technology platform and we have a list of preferred technology suppliers that we can recommend based on your needs. If you already have a Virtual technology set up and you’re simply adding LES MILLS™ Virtual to the mix, then it is as easy as ‘pressing play’. Please contact your Account Manager for more information. What studio set up is needed? I want Les Mills Virtual in my club. What’s the next step? Simply get in touch with us to get Les Mills Virtual set up in your facility.